I would like to announce an update on my book, formerly and tentatively titled, The Favorite Flies of Mary Orvis Marbury. After a suggestion from my friend Alec Stansell, I got to thinking. The title may be misleading in that all 291 of the patterns from her 1892 book, Favorite Flies and Their Histories, were not actually her patterns. Most likely, her book flies were integrated into the Orvis commercial inventory, but a good many of them were sent in by the many correspondents from the United States and Canada. Considering this my new book title is: Favorite Fishing Flies – 1892. Eric Austin – Ohio; Tom Baltz – Pennsylvania; Don Bastian – Pennsylvania; Dave Benoit – Massachusetts; Scott Bleiler – Georgia; John “CJ” Bonasera – Pennsylvania; Austin Clayton – Colorado; Matt Crompton – Virginia; Chris Del Plato – New Jersey; John Hoffman – Ontario; Dave Lomasney – Maine; Ronn Lucas, Sr. – Oregon; Ed Muzeroll – Maine; Ted Patlen – New Jersey; Bob Petti – New York; Roger Plourde – Connecticut; Kat Rollin – New York; Paul Rossman – Connecticut; Dave Schmezer – Florida; Mike Schmidt – Ohio; Bill Shuck – Maryland; Leigh Shuman – Pennsylvania; Royce Stearns – Oregon; April Vokey – British Columbia; and Rick Whorwood – Ontario. I find it interesting that these fly tiers are from across the Unites States and Canada, much the same as the correspondents of one-hundred twenty years ago were for Marbury’s original work. I also want to announce that I just made a CD of the original book plate flies that I have thus far photographed; 24 of the original 32 color plates. I will be running these in slide show format on my laptop at the upcoming shows. The Juno, a pattern originated for fishing in Maine. This photo was taken through glass that has not been cleaned on the inside for 120 years. There may have been a bit of glare, and it was hand-held. 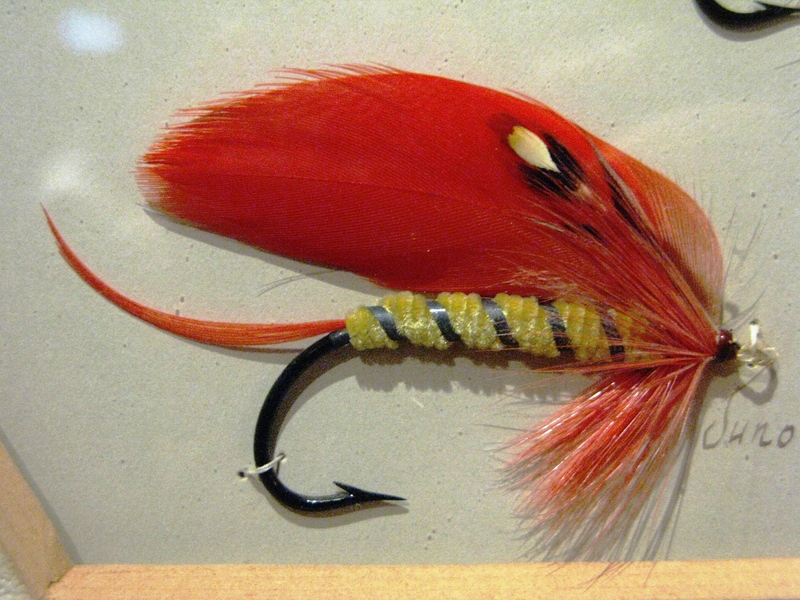 Hopefully you “get the picture.” That’s real scarlet ibis for the wing and tail and silk chenille for the body. I’d say this hook is about a 2/0. Back in the 1800’s there were still a few eight pound brook trout swimming in the Rangeley Lake Region of Maine. That was before the unfortunate extirpation of the forage base blueback trout. Release date is not yet determined. This entry was posted in New Book and tagged Favorite Fishing Flies - 1892, Favorite Flies and Their Histories, Mary Orvis Marbury. Thank you Fred! Nice to hear from you! Hope your Michigan winter isn’t too severe…thanks so much for your comment and support! Thank you for the update, Don. It sounds like this will an instant classic, and a must-have read and reference. I appreciate your endorsement and support. Instant classic, well I don’t know about that -;-) – only time will tell. Thank you for your comment! See you next Thursday at Marlborough! Thanks for your comment! I’m glad you are one one of my contributing tiers, my friend! Hope to see you soon! It looks like you have been putting a ton of work into this Don. It’s good to read an update. Keep up the great work! Thanks for your comment! After returning from Maine in early October, I did put a lot of time into research on the patterns, mostly getting all the recipes in chronological order. I had them done previously for my tiers, but they were randomly scattered. Plus, I studied and analyzed the 1893 patterns, assessing the components. I had a few 10 – 14 four days on it around Columbus Day. Thanks for your support! I’m waiting with HUGE anticipation for my copy! One question, are the advance copies pre-signed by yourself and then despatched or do we need to get the book to you after we receive it? Thanks for your support and anticipation! To answer your question, the Limited Edition copies will all be signed before shipping to the purchasers. I am finally after two months of being quite ill and debilitated, on the mend. Considering the weight I lost, I’ll need time to put some of that back on. 😉 Thanks for your comment! Hi Don, will be a great book indeed. Thanks for your comment, appreciate your interest! Thanks for your help! Will you be at Marlborough? Thanks for your comment! Glad to know that you are familiar with some of these talented tiers that have contributed to this project. And I appreciate your interest in the book! Folks, Al is a great tier, look for him at the Somerset, New Jersey Fly Fishing Show, January 25 – 27. Thanks for your comment Al! Absolutely a must-have book! I have contacted the Whitefish Press some weeks ago, but still haven’t had an answer from them. Is it possible to get a copy to Europe as well, or is this States-only? Thanks for your interest in my book! I’m sure you can get a copy in Europe. If you contacted Whitefish Press already then I wouldn’t worry too much…the manuscript has not yet been submitted. I’m sure your name is on “the list.” Thanks for your comment!